The Centre for Jazz and Popular Music will present the Jazz Drum Showcase by selected foundation, and 1st to 3rd year UKZN students on October 18 at 18h00. 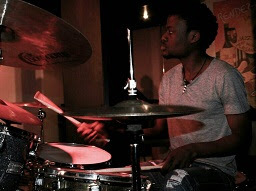 The drummers will perform music that include the pieces from the student’s exam repertoire, and repertoire from South African legends like Bheki Mseleku and other genres which range in style from Bebop to Contemporary Fusion. Other items will be the student’s compositions. The participants include Siya “Dragon” Xulu, Lesedi Tlholoe, Nkululeko “Dusty” Ndlovu, Seko Mnguni, Caleb Frow, Skhulile Sibisi and more. This concert is the last from a series of instrumental showcases that happened over the course of the year. Enjoy the Jazz Drum Showcase on October 18 at 18h00 (doors open at 17h30) at The Centre for Jazz and Popular music (CJPM), Level 2, Shepstone Building at UKZN Howard College Campus. General admission R70 (R45 pensioners, R20 students).